"The Paleo diet is the healthiest way you can eat because it is the ONLY nutritional approach that works with your genetics to help you stay lean, strong and energetic! Research in biology, biochemistry, Ophthalmology, Dermatology and many other disciplines indicate it is our modern diet, full of refined foods, trans fats and sugar, that is at the root of degenerative diseases such as obesity, cancer, diabetes, heart disease, Parkinson’s, Alzheimer’s, depression and infertility." It's possible you found this site looking for local food, which is fine, but now you might be curious about the Paleo Diet. Essentially the Paleo diet is turning back the clock on how we eat and mimicking what our ancestors ate closer to the ice age (modernized of course). It's been shown that our bodies cannot handle certain foods all that well and may be why we have increased obesity, diabetes, and cardiovascular issues over the past century. The ideal method is sticking to foods that we can digest easily and avoiding those known to cause inflammatory or allergic reactions. Once on the diet many people adjust things as they find they're compatible with certain foods and others do not. 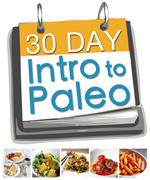 The Paleo Diet is merely a label for a structure and may be modified accordingly to a person's needs. This way of eating has been shown to reverse a lot of metabolic disorders and autoimmune conditions along with reduction of weight. It is an ideal and healthy way to eat in accordance with how our system works. It seems like a lot of work, but it is quite simple in concept, just eliminate processed foods in favor of whole foods and clean meat sources. It does take some adjustment time and some prefer to go at it slowly eliminating food groups as they go. Others prefer to go cold turkey and embrace this lifestyle full force. It is truly up to the individual and their needs. Always seek the guidance of a medical professional prior to changing anything in your diet. Some people have a hard time transitioning and it is good to have someone monitoring your health as you progress, especially if you have debilitating issues from the onset. Is it worth it? Absolutely. The improvement in energy levels, weight loss, and reversal of years of treating your body poorly will be easily recognizable. You will spend less time visiting a doctor for ailments and spend more time enjoying life. Not only are there health benefits but you also provide for the local economy or small businesses that are trying very hard to bring you quality over quantity at the expense of your health. Stop feeding the corporate machine while your nutrition and health suffers and embrace a different lifestyle!